Very often I default to a few select proteins for my meals–more often than not, it’s chicken– how boring! I’ll throw in ground beef, steak, shrimp, salmon now and then…but there are so many more options out there. I realized I needed a little variety. For instance, why no pork? Pork is delicious. 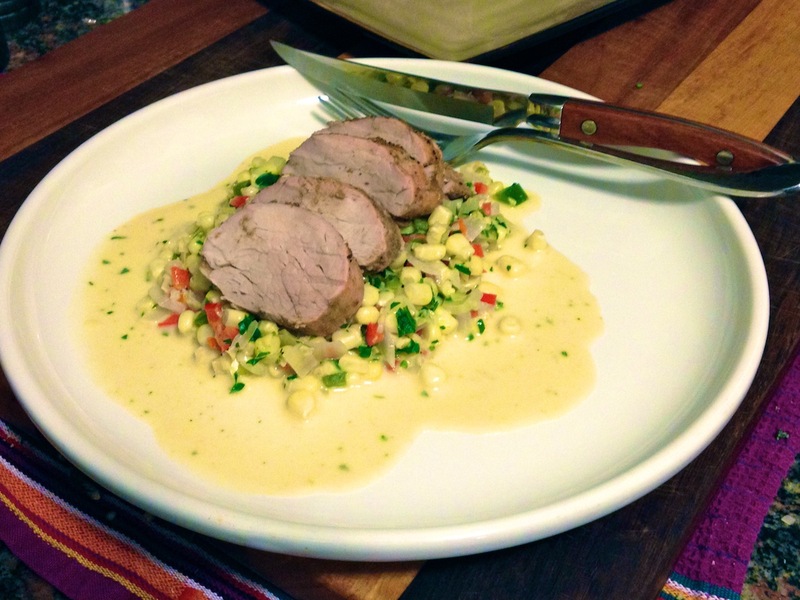 This Rachael Ray recipe for cumin and lime roasted pork tenderloin gave me the inspiration I needed. The pork came out perfectly, still moist and tender, and with some spice and tang from the cumin and lime. 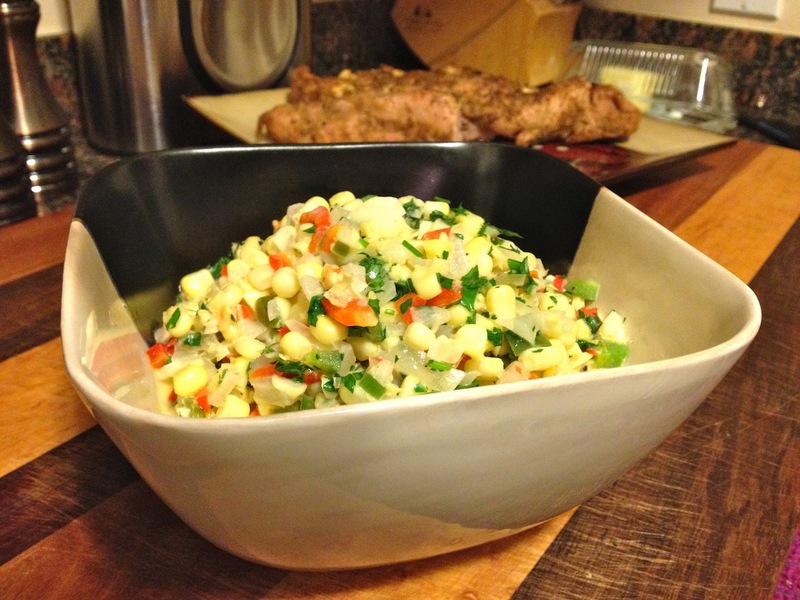 The spicy corn was a great side dish — it’s got great heat from the jalapeño. I found some beautiful pork tenderloin at Costco — these came in a two-pack, with two smaller tenderloins in each package. Grocery stores often sell pretty large tenderloins and it can be hard to find smaller ones, so keep your eye out next time you go grocery shopping to see if your regular store sells them. I’m partial to fresh corn (versus frozen, which can get cardboard-y/chewy) — I found some husked ears at Costco and they were surprisingly good and fresh! This does make a lot of pork — I got a little tired of eating it straight up, so I made mini sandwiches with avocado and Dijon mustard on rolls and they were delicious! The corn makes a lot. Unless you’re feeding a bigger family I’d cut it in half and serve with a green vegetable as well. The meat came out just perfectly medium with a little bit of pink left — perfect! 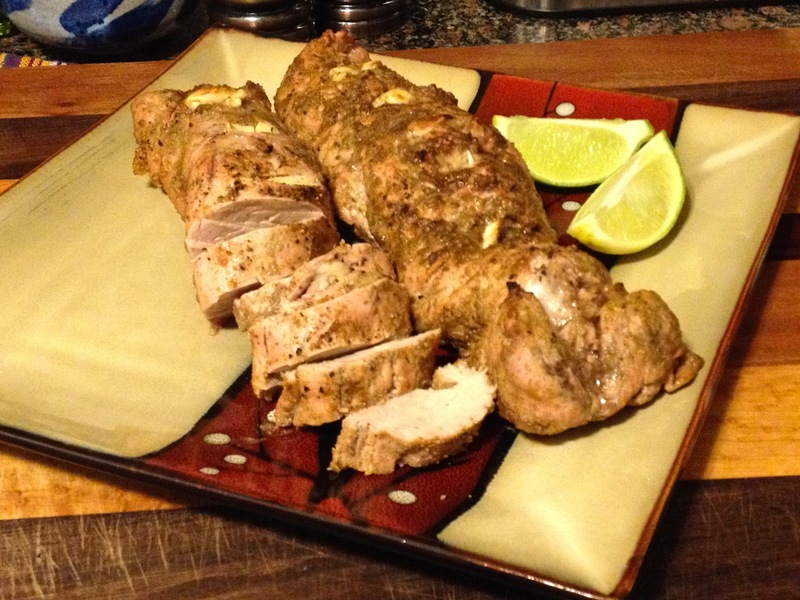 If you get a larger pork tenderloin you’ll have to cook it longer. These were a little over a pound each, for comparison. Preheat oven to 500°. Trim the sliver skin or connective tissue from the tenderloins using a very sharp, thin knife. Place tenderloins on a rimmed nonstick cookie sheet; coat them with the lime juice, rubbing the juice into the meat. Drizzle olive oil over the tenderloins, just enough to coat (about 2 tablespoons). Season the meat with the cumin, coriander, salt, and pepper. Cut small slits into the meat and disperse chunks of the cracked garlic cloves into the slits. Roast for 20 minutes; remove from oven and let rest for a few minutes, tented loosely with foil. While the pork is cooking, preheat a skillet over med-high heat with 2 tablespoons olive oil and the butter. Add in the onions, jalapenos, bell pepper, chopped garlic, corn, salt, and pepper; cook 4-5 minutes, or until the onions are tender. Sprinkle with the flour, and continue cooking 1 minute. Whisk in the chicken stock and heavy cream; bring mixture to a simmer and then lower the heat to medium-low; cook until it is thick and creamy, about 5 minutes. Add in the parsley and cilantro; taste and adjust seasonings with salt and pepper. 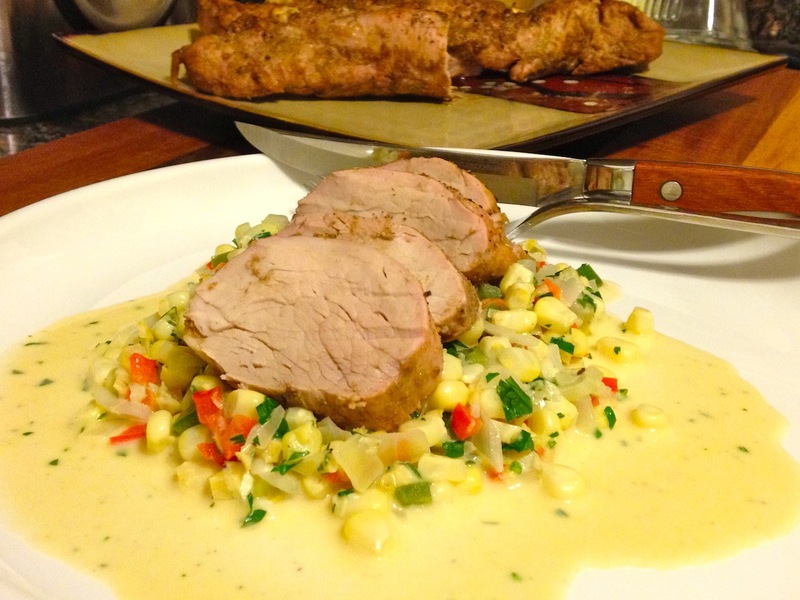 Slice the rested roasted pork; serve with spicy creamed corn.